Nested layer Controls shows how to turn on the Nested Layer Control so that Bone and image layers can properly talk to each other correctly. For example if you have a character rig where all the image components are buried in sub folders, turning this setting on will make sure they behave as you would expect and not become detached from the bones. Patch layers demonstrates a special kind of mask layer that can hide unwanted lines around your characters joint rigs and more. Advanced bone rigging walks you through the basic steps of adding a bone rig to a simple, single image, character or a more complex character made from many layers. Almost everything in this video has been covered before, except for Smart Bones - which are a way of making adjustments to a bone rig to fix problems with image distortion. Bone Constraints runs through all the different types of bone constraints, that allow you to limit bone movement in all kinds of ways for different effects, such as restricting the angle of a bone's rotation so that it can't' be moved beyond certain angles. For example, say you have a bone rig of a knee joint. You can add constraints to the joint so that the knee cannot be bent forward into an unnatural motion. There's also options to incorporate 'squash and stretch' into bone manipulation. Bone Enhancements demonstrates how bone layers can be nested within bone layers, as well as being able to color code individual bones and give them labels that can be displayed in the stage area. Smart Bones demonstrates the entire concept of Smart bones in more detail (since we've already seen a brief introduction in Advanced Bone Rigging) using a demonstration of adding a bone dial to a character mouth. Smart Bone Enhancement is just making a note of a new feature, where the initial smart bone actions are already created, allowing you to bypass this step and get on with setting up your bone action. Smart Bone Update is a run through of different ways you can use smart bone dials to manipulate and animate styles of lines, fills and 3D objects. I must admit I'm a bit over learning Moho Pro 12 at this point. 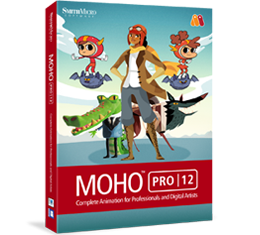 There are just so many videos to get through, with another 24 in the Pro series to go followed by a further 18 on just the new features added into Moho 12. It feels like I've had a good tour through all the features but I'm really starting to forget what I've learned so far. I do hope to continue on and blog my progress but I have other projects I need to work on and this is now taking me away from that. 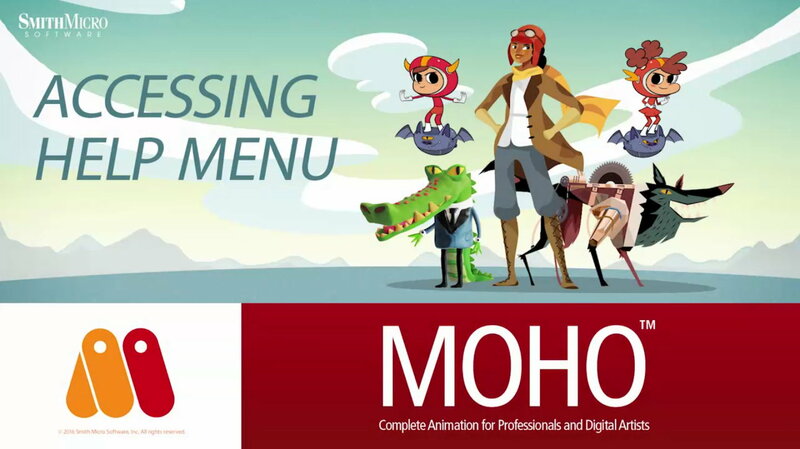 It's great that Moho Pro 12 has so many features... but at some point it does become far too much. You'll find the next post here. One thing that I wanted to mention, but don't believe I can edit previous comments, is this. I have tried working with Smith Micro on multiple occasions to do their tutorials because they are so 'cut and dry'. There rarely is ever any substance/ goal or objective. Which is probably why you are feeling bored or overwhelmed by the amount of dry tutorials. Before Smith Micro used to use Infinite Skills which basically inspired me to start teaching and creating my own courses. I too started learning through paid and free courses and realized most of those, that I was learning from, had little to no 'skill' or animation/ artistic abilities. They were just 'good instructors'. So that's what I hope to achieve with my courses is not just teaching you some pretty boring stuff. But applying them to your character in real time. And at the end getting an awesome end result like 'how to create an action scene' or show you step by step how to rig your character applying smart bones and everything you learned as we were building the character etc. Hi McCoy, Sorry it's taken a few days to get a response... just a busy time of the year for me. I must admit your course does sound interesting and your approach to teaching is very much in line with how I think online tutorials should be. What passes for tutorials these days is unedited screen captures with an instructor voice over. Which is fine, some of the time but not the best presentation method when you're watching a batch of tutorials in sequence. Moho's own tutorials aren't too bad in comparison to some I've been doing recently but, once you get past the basics and start getting into the details of the software, it does become tedious. If you would like to contact me further with your free content proposal by all means shoot me an email (you can get my email address from the Contact and Copyright Info box at the bottom of the left most column above.